Agriculture has always been a crucial part of the Chinese identity and cultural heritage. At the heart of China, where agriculture began to flourish, is the Loess Plateau, which has taken millions of years to be blown in by the wind, and known as ‘cradle of Chinese civilization’. The Loess Plateau covers an area 2.5 times the size of UK, and is stripped away by the mighty Yellow River, a raging torrent which washes up to 1.6 billion tons of soil downstream every year (Williams 2010). Researchers, practitioners, and policy makers in China and around the globe have been working on soil and water conservation on Loess Plateau since the dawn of 20th Century. From the eastern part of Loess Plateau, climate transitioned from semi-arid to arid to the inner west. Facing the encroaching desertification from the deserts to the northwest, and the massive urbanization projects within the region, rural farmers on the Loess Plateau are torn between conservation, mechanization, and economic development. To control severe soil erosion on the Loess Plateau, the Chinese government devised a series of policies for fragile ecosystems, such as the 1999 state-funded “Grain-for-Green “project or Sloping Land Conversion Program, which has resulted in significant land use changes. Related programs have produced beneficial effects on reducing soil erosion and water cycles. However, the long term impact of these changes in soil and water cycle on ecosystem functioning is unknown and demands further study. Against this backdrop, forestry agencies in Shanxi province on the Loess Plateau has opened up experimental spaces for different approaches to ecological restoration, including efforts led by grass-roots organizations. Figure 2. Location of Shilou County, Shanxi Province, China. The challenge of afforestation on the Loess Plateau is the efficient and reasonable use of water resources and soil conservation due to the characteristic hilly and fragmented landscape. Terracing and soil amendments are among the many ways to achieve this goal. Mostly rain-fed agriculture (annual precipitation ranges from 400 to 600 mm), the vegetation includes naturally grown grass, shrub and trees that scattered at the edge of hills and gullies. The word “loess” comes from the German word for “loose.” Loess is soft enough to carve, but strong enough to stand as sturdy walls. On the loess plateau, more than half of the residents build cave-like dwellings in thick loess cliffs that are cool in summer and warm in the winter. Not all lands are suitable for reforestation. Those with least productivity and steep slopes, which cost a lot for maintenance are designated as reforestation zone. Native species that are tolerant of drought is planted with proper density to avoid unnecessary water consumption. On places where land is relatively flat with higher productivity, cash crops would be priority. The non-governmental organization based in Hong-Kong called Green Action Charity Foundation, is leading a reforestation project in rural Shanxi province, with the help from the local government. They are planning to plant 100 acres of bare-land this year. Moreover, local grass-roots initiatives from Hong Kong is now subsidizing the village to build a bridge which might help improve transportation and development of economy of the corn field at level ground below the plantation site. The villagers are planning to grow more vegetables instead of corn to have more financial income as the water table there seem to improve after the reforestation. Figure 4. Corns planted on flat farmland in rural Shanxi & Figure 5. 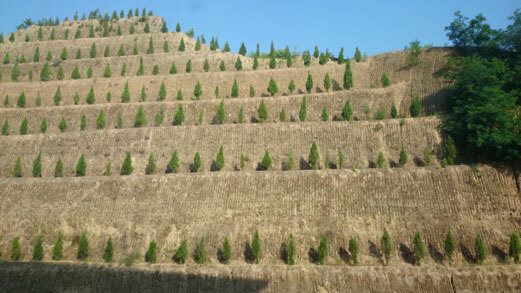 Terraced hill planted with mixture of Robinia psudoacacia (Black locust), Populous simonii (Cottonwood) and Pinus tabulaeformis (red pine) seedlings in 2009 in Shanxi. The transition from smallholders’ economy to larger-scale commercial production requires sound and steady adaptation that fits local social and environmental management arrangements. Especially on the Loess Plateau, where gullies and hills fragmented the landscape, large scale production like those in the US is not suitable. The term conservation agriculture (CA) is prevalent in Shanxi and Gansu provinces, both located on the Loess Plateau. Increased water infiltration and reduction in water and wind erosion is achieved through reduced tillage and retention of ground cover. But it is still moderately embraced by farmers, who are skeptical of the outcome of some of its lauded technology and find precision agriculture not worthy of investment when market prices are volatile in the near future. However, several techniques have already been widely implemented due to its easy access, low cost and risk such as: terracing, ridge-furrow irrigation, plastic mulch, and fertilizer. Reforestation does not produce immediate financial gains for farmers to improve the quality of life they desire. In rural China, the definition of well-being is changing, albeit slower than its urban counterparts. I still remember a local village resident who hosted me during my visit in rural Gansu province asked: “Are you here to lift the poor?”. The term, lifting the poor, is the party-government’s official lexicon, a term very pervasive in rural China. The residents of the village are conscious of the fact that they were being labeled “poor”, which in China also implies “backwardness” and lacking “quality” (素質) and “civilization” (文明). Under the development banner of “Scientific development and Harmonious homeland “, most public agency from local to national-level, has a designated village that they are responsible for supporting financially, as part of the national poor lifting policies. Figure 6. 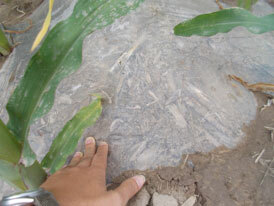 Plastic film mulch reduces water usage through reducing evapotranspiration in rural Gansu. However, massive used films have also become a waste issue. What is missing from the push for conservation agriculture and reforestation is the ‘human development’ component. What does the future entail for the villagers in Shanxi and Gansu provinces? What are their visions of their land and lives for future generations? As technology and science advances, would we be able to create a sustainable future in a meaningful manner in less than a few decades? Is it possible that when we (outsiders) view China, we miss the forest for the trees? In both developed and developing countries, conservation efforts are growing as concerns about environmental sustainability led both Chinese leaders and citizens question their earlier approaches towards development. The durability and environmental outcome of these government-sponsored and grass-root initiated reforestation projects is unknown at this time, but the cooperative process among local officials, NGO and farmers is valuable because it offers an alternative way of governance that enables ‘two-way learning’, albeit slow, that would help us understand how to incorporate the human-development considerations with the technocratic way we govern our environment. And we do have a long way to go! Figure 7. 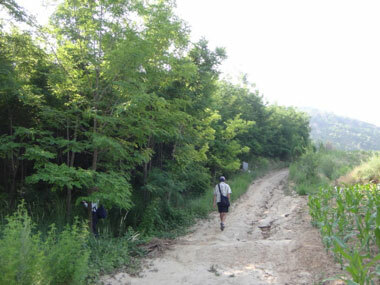 Reforested area from 2006 in Shanxi province. Acknowledgements: The author is grateful for Green Action Charity Foundation (GACF) based in Hong-Kong for providing the opportunity to participate and to learn about their reforestation efforts. GACF is the leader and sponsor of the reforestation project in rural Shanxi. The author would also like to express gratitude to partners from Shanxi Academy of Forestry, local researchers, and farmers from both Shanxi and Gansu province. Last but not least, the author are grateful for CLIMAS’s fellowship program for the opportunity to further this research project.